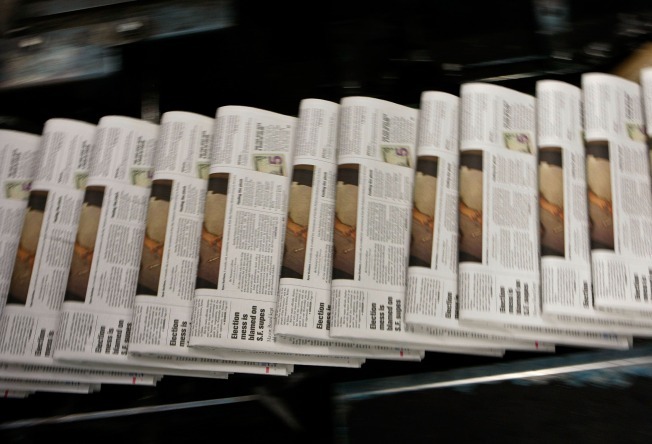 24/7 Wall St. has analyzed the newspaper industry and ranked the daily newspapers most likely to stop staining your fingers with ink. The newspaper industry continues to struggle as evidenced by the closing of the Rocky Mountain News, the bankruptcy of the Journal Register chain, the Hearst announcement that it will close the San Francisco Chronicle if it can't make massive cuts, and the bankruptcy declaration of The Philadelphia Newspapers LLC, the parent company for Philadelphia's Inquirer and Daily News. The Seattle Post Intelligencer, also owned by Hearst, seems certain to close or move strictly online, too, Time reported. Even the New York Times is struggling. The paper sold part of its headquarters -- 21 floors of its 52-story building -- to an investment firm for $225 million. The Times is leasing back the space under a 15-year contract. 24/7 Wall St. has compiled a list of the 10 major daily newspapers at the greatest risk of closing or being published strictly online. The analysis factored the parent companies' financial well-being, the amount of competition in the market and the amount of money the papers are believed to be losing.